How do you make a dangerous intersection safer for pedestrians? By getting rid of the pedestrians, of course! 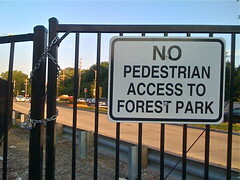 Gate locked, pedestrians can no longer access the shoulder of Forest Park Pkwy. Such is the message the City of St. Louis recently sent to residents of the 5700 block of Pershing Ave when a gate in a fence was locked. Pedestrians had been using the gate to access the raised paved shoulder along Forest Park Pkwy on their way to the nearby Forest Park-DeBaliviere MetroLink station. With the gate locked, the station now lies out of reach. As this blog covered back in early July, a new sidewalk ramp at the intersection of Forest Park Pkwy & De Baliviere Ave created a dangerous situation: a new 5-ft concrete wall blocked the shoulder along Forest Park Pkwy that pedestrians had been treating as a sidewalk. Getting around the wall then required walking into the traffic lanes of Forest Park Pkwy. The intersection was a pedestrian casualty waiting to happen. As also mentioned previously, the city doesn’t consider the raised paved shoulder along Forest Park Pkwy a sidewalk. The city discourages it’s use use telling pedestrians to “use the neighborhood walks,” instead. This position stands in contrast to both MoDOT and St. Louis County: e.g. MoDOT is actively upgrading the raised shoulders along Lindbergh Blvd to true sidewalks; St. Louis County, while it doesn’t consider the raised shoulder along Hanley Rd north of I-64 to be a sidewalk, does not restrict its use to pedestrians. The city’s response to the dangerous pedestrian situation it had created: prevent the pedestrians from accessing the parkway’s shoulder and from reaching the intersection by locking the gate in the Forest Park Pkwy fence. What the city should have done: convert the parkway’s shoulder into a true sidewalk and remove the new sidewalk ramp’s wall that currently block the way. A consequence of locking the fence’s gate is that residents of the 5700 block of Pershing Ave are no longer within easy walking distance of the nearby MetroLink station. As can be seen in the graphic below, the 5700 block of Pershing Ave lies within 400 meters of the Forest Park-De Baliviere MetroLink station, an easy 5 minute walk at most. With the gate locked, residents must now detour to the Waterman Ave bridge in the upper-left portion of the picture to get to the station: an easy 3-4 minute walk has become a discouraging 7-9 minute walk. With Metro fighting for funding of the regions rail and bus systems, the city should be doing everything it can to encourage ridership, not discouraging it by making transit more difficult to access. The locked gate has almost certainly cost MetroLink a few riders. A blue arc represents a 400-meter radius from the Forest Park-De Baliviere MetroLink station. The 5700 block of Pershing is on the left side of this picture tucked between the MetroLink tracks and Forest Park Pkwy. The locked gate puts this block out of walking distance from the station. The following is a summary of the events that have occurred in relation to the intersection of Forest Park Pkwy & De Baliviere Ave. The Forest Park-De Baliviere MetroLink station is rebuilt as part of the Cross County Extension which extended MetroLink to Shrewsbury. Excessively steep curb ramps are built on the north side of the intersection of Forest Park Pkwy & De Baliviere Ave.
St. Louis Board of Public Service constructs new ADA-compliant sidewalk ramps. One of ramps walls-off the raised paved shoulder on Forest Park Pkwy. Residents of the 5700 block of Pershing, who had been using the parkway’s shoulder as a sidewalk to access the MetroLink station, are forced into traffic to get around the new sidewalk ramps. Gate in the fence along Forest Park Pkwy is locked. Residents of the 5700 block of Pershing, to access the MetroLink station, must now detour to the Waterman Ave bridge to cross the tracks. This detour puts this block of residents outside of walking distance to the station. Pedestrians should not be walking on a limited access highway. Neighborhood access to the Metrolink station may be longer but safer on city streets. I hope you don't mind, but I stole your picture and used it on my own blog,http://stlelsewhere.blogspot.com/2009/09/st-louis-science-center-bridge-hong.htmlPlease update your blog. Your observations are fantastic and needed. I really respect your efforts.